In stock 8 pcs. Also available in our walk-in store. 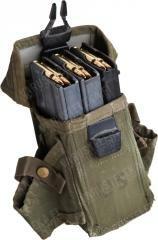 The classic ALICE magazine pouch for three 30-round M16 mags, adopted in 1973. Used. The US ALICE load bearing system was designed around the end of the Vietnam war and was widely in use by the mid-70's. In its 40 years of existence it has become a very commonly used magazine pouch worldwide. The pouch is a completely enclosing nylon "box" with plastic reinforcements to keep the front and back in shape. The closure buckle is large, easy to use and silent. On the inside you might find webbing dividers, but these are often removed. On the backside you'll find two US keepers, which are removable belt loops made of steel. 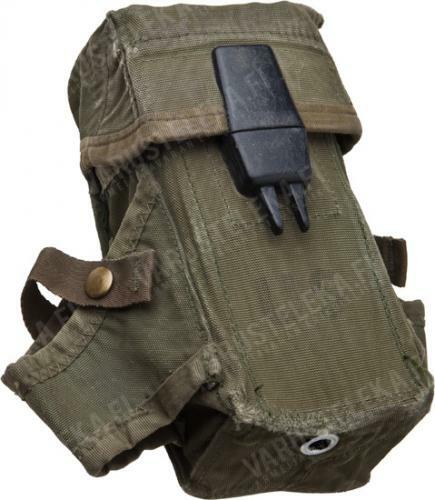 They can be used to attach the pouch to belts up to 55 mm (2.25") wide. 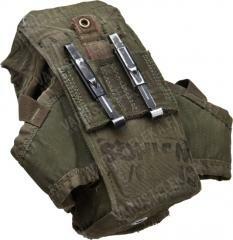 Can also be attached to newer MOLLE-compatible webbing. 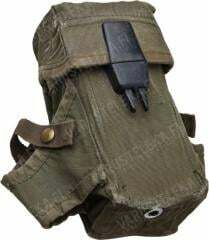 Alternatively to three M16 magazines, this will also hold FAL/G3/M14 magazines, or work as a small general purpose pouch, making it a pretty versatile item. In used but perfectly serviceable condition. Purchased two. One didn't have the dividers, but looks like it was made without them, not cut. Very sad. Still good. perfect for provisioning a long hike. i’ll have my main meals accessible on my backpack and carry cigarettes, trail mix, gum & dog poo bags (empty) in one of these. they also fit beer cans. and you can hang fruit on the grenade loops. 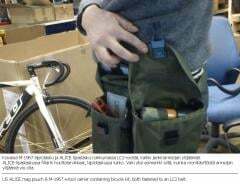 En huomannut mitään nauhoituksia sisällä, enkä usko niiden puuttumisen vaikuttavan sekunnin kymmennystäkään lippaan kaivelussa.